Jang Yoon Ha (UEE) is the youngest daughter of a chaebol family, but she longs to find a man who will love her and not her wealth. So she goes to work at a food market and pretends that she comes from a poor background. Meanwhile, Yoon Ha’s manager is Choi Joon Ki (Sung Joon), a man who is determined to succeed to leave his destitute upbringing behind him. He even begins to think that marrying a well-connected woman will finally give him the lifestyle he desperately seeks. In her job, Yoon Ha makes fast friends with her co-worker, Lee Ji Yi (Im Ji Yun), and also meets Yoo Chang Soo (Park Hyung shik), the heir to the mall conglomerate where the food market is located. Chang Soo is very accustomed to his well-to-do lifestyle and enjoys having women fawn all over him because of his wealth. That’s why he is intrigued by Yoon Ha’s complete lack of interest in him. I had waited so long for this drama to complete so I can watch it at one go, so believe me when I say that before I started I already had this feeling of loving it. Don’t know why, maybe because it had what I’ve been looking for in a drama. Rich and powerful chaebols, and finally this time the main handsome guy is the poor one (he is not that poor, but this time it was the girls family that opposed). 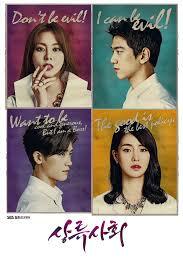 I think it was my big anticipation for it that made the drama good, not the actual drama. The story was exciting and entertaining at the beginning, but somehow it fell in a loop, where the same problem occurred again and again. It kinda gets tiresome in the end, I just wanted to skip till the end, but Sung Joon didn’t let me :b He really did become this ambiguous man who wanted power and respect for his family, the character it is. I really liked him in the beginning because, you really couldn’t figure out if he was the good guy or the bad guy who turns good. He keeps making you change your mind on him all the time, I liked that. Uee has definitely made progress as an actress, and as a person who have watched all her projects/dramas, I can tell she really overcame the “Idol-turned-actress” title and became a real actress. Both couples had chemistry and a good vibe, but as I started with, the same problems kept occurring so it really didn’t make any progress towards the end. To conclude, I liked it, but not my favorite.